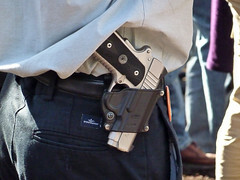 In the Commonwealth of Virginia, little is required to open carry a handgun. You don’t need a special license or certificate, and you don’t even have to have the firearm registered. So I was eighteen years old. Legally, I couldn’t purchase a firearm but I could carry one on my person (and with a certain permit, I could carry one concealed). And I knew this. I have a sort of routine walk that I use to advocate open carry. I know where the school zones are. I know where the government offices are. And so my route is quite safe from any zone that could get me into serous trouble if I choose to carry a firearm. While taking a walk down Lauderdale Drive one day, I was stopped by an officer. At that time I was openly carrying my Sig P226 handgun with a type-3 security holster, and that is what alerted the officer. I was facing south and the officer drove by also going south. We made eye contact and he saw my pistol. He immediately did a U-turn and stopped his car where I was. He then got out, clearly ready to deploy his own handgun. The officer asked me just what I thought I was doing, and I told him what I tell everyone who confronts me about carrying a firearm. “I am exercising my rights”. He was very angry at me for that. I suppose he thought I was trying to be a wise guy, which I wasn’t. He shouted at me to produce my ID. I asked him three questions: ONE, are you investigating a crime? TWO, are you issuing a summons? THREE, are you detaining me at this time? I then told him that I was not required to show him my identification because of the questions I asked him. Once I established that he had no legal premise to keep me there, I told him that if he didn’t mind, I’d rather be on my way. I didn’t ask him if I was free to go (because they always tell me that NO, I am not), I simply told him that I was going to be about my business. I began walking, and the officer didn’t stop me. It feels good to FLEX YOUR RIGHTS.